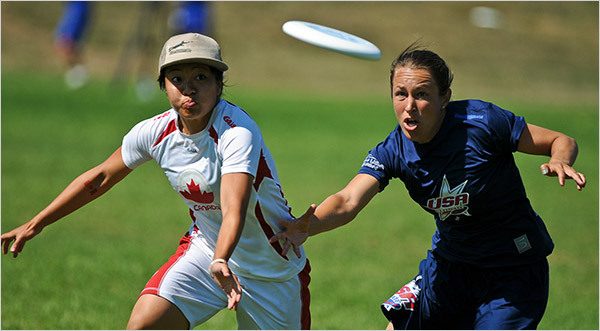 One of the things I miss most from our pre-trip life is that I used to play Ultimate Frisbee just about every day. Many people laugh and say “that’s not a real sport” (before returning to watch golf or NASCAR on the television) despite acknowledging the fact that this sport take just as much effort and energy as the more popular soccer or basketball. Today marks the first day of the Ultimate Frisbee Beach World Championships in Italy and although I highly doubt I’ll be able to catch any of that event, I do want to share this game with all of you. The most wonderful thing about this game is that it involves very little actual skill to get started. If you can dodge a… no wrong sport. We carried a frisbee around the globe with us. We were always ready for a game if and whenever we could find enough people (4 people to a team is a good minimum). As you progress and get better you’ll begin to pickup some of the finer parts of strategy and technique but for now we’ll just assume you can throw and catch a frisbee. Pick a plot of land and mark it off as you would a football field or a rugby pitch. Once you have two teams each choose a side and ‘throw off’ just as you would kick off in either of those other sports. When a team has the disc/frisbee that team will attempt to throw it to eachother as they move down the field toward their goal. The one catch is that while holding the disk, you cannot run/walk…you must stay stationary with a pivot foot just like a basketball player who has stopped dribbling would do. When you have the disc and you want to throw it to your teammates it is up to the other team to stop you from doing so. If they interrupt your pass the disc is theirs and it’s time for them to try and score on you. When you’re defending you’ll need to not only cover the receivers but also cut off the throwing lanes. Skilled players will begin to watch angles on the field and will demand that their teammates keep moving in order to keep the angles, and opportunities, changing. Then it comes time for different types of throws, most people know how to throw a frisbee but how many know how to throw it forehand or over the head? Throwing the disc different ways affects how it cuts through, its spin and ultimately its trajectory. Basic physics here, but I think you’re getting a sense that it’s not just a game. What I love most about this game is its utter simplicity. No pads or nets or hoops or uprights. The only game I know that is as simple to learn and play is soccer….and as any good soccer player will tell you, once you know the game it’s anything but simple. The same thing is true of Ultimate. I do miss playing my daily game on the National Mall but I have luckily come across a new local game starting up not too far from our new home. I intend to make it just as often as I can….even if that means an extra 10 miles on my bicycle!